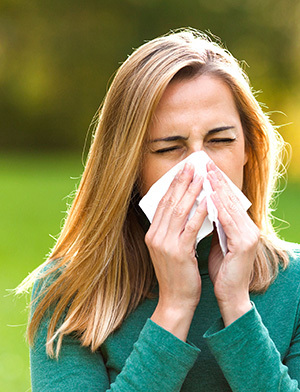 Among the most common chronic conditions, allergies impact up to 50 million Americans. They can strike at any time or age, sometimes disappearing and returning years later. All forms of allergic reaction begin in the immune system. While it normally protects us from invading organisms, in the case of allergies the immune system mistakes an otherwise harmless substance as an invader and overacts to this allergen by producing Immunoglobulin E (IgE) antibodies. These travel to cells that release histamine and other chemicals, causing an allergic reaction. An allergic reaction typically triggers symptoms in the nose, lungs, throat, sinuses, ears, lining of the stomach or on the skin. For some, allergies also trigger symptoms of asthma. In the most serious cases, a life-threatening reaction called anaphylaxis can occur. Allergy shots are a form of immunotherapy which desensitize your body to a particular allergen or allergens so as to prevent severe reactions. Allergy shots allow increased tolerance to pollens (grass, tree, weeds, ragweed), mold, and perennial allergens (cat, dog, horse and other pets, cockroach, dust mite) and thus a decreased tendency to exhibit allergic symptoms. Similar to vaccination, allergy shots work by shifting the immune response to a more productive, less hypersensitive (allergic) one. Patients are given gradually increasing doses to allow the immune system to adapt in order to decrease the allergic response to the allergen. Allergy shots can result in a significant reduction in symptoms. Some symptoms may disappear during part of the year, whereas others may be lessened but not disappear completely and “bad” pollen years may still occur. It is important to be aware of the time-commitment and side effects. Typically, during the “build-up phase”, which lasts approximately 5-9 months, a patient returns for injections once or twice weekly, respectively (twice weekly completes this step in ½ the time). During the maintenance phase, the injections are once a month. Vacations and illnesses necessitate occasional absences so communication with our office is key for optimum benefit to prevent relapse of allergies. As an alternative, we offer Modified Rapid Allergy Shots in which patients can achieve maintenance concentrations at a fraction of the time. Not every patient is a candidate for this technique, however. For patient safety, allergy injections are given in a medical office with a board-certified Allergist present and emergency medical equipment is available. As well, all patients have an epinephrine auto injector and are asked to wait 30 minutes after the injection to monitor for side effects. Local reactions are common and systemic reactions can occur at a rate of about 0.1%. Serious reactions can occur. Most are treatable in the office with the epinephrine auto injector and medical equipment with prompt attention. In order to avoid issues, we ask that you not get an injection when ill, when your asthma is acting up, if you are short of breath or have chest pain for any reason, or if you do not have your epinephrine with you. If you do not feel well after your allergy shot, we ask that you immediately bring it to our attention. Allergy drops are a form of sublingual immunotherapy, which is an injection-free way of treating allergies. Allergy drops, also known as Sublingual Immunotherapy (SLIT), are thought to decrease allergies in a way similar to allergy shots by progressively increasing tolerance to the allergens thus decreasing potential for allergic responses. For greatest efficacy, however, they must be administered daily. They are not yet FDA-approved and as such are typically not paid for by insurance, making them an out-of-pocket expense for most patients. The other side effects of sublingual drops are similar to the sublingual tablets (see below). Sublingual tablets are available that are FDA-approved, but they may take up to 3 seasons for full efficacy and are only available as monotherapy (therapy that uses one type of treatment) for grasses, ragweed and soon dust mite. Some studies have shown that administering allergens sublingually or orally can cause or perhaps increase the chances of causing autoimmune forms of colitis (inflammation of the colon). Other issues include oral swelling and discomfort, changes in taste, numbness, tingling, itching, and irritation of the tongue, mouth and throat, abdominal pain, nausea, vomiting, diarrhea and allergy, which can be severe. Key steps in the process will be a thorough medical history and allergy test selection.